This is our go-to black olive tapenade recipe. Incredible and amazing. Puts the jarred olive tapenade you buy in the store to shame. Be sure to try it in the tart. I think this would be a good recipe, but 1 tsp of salt was too much for me. Worth tinkering with. Just plain amazing. The book pretty much falls open to this page... Wish everyone loved the ingredients as much as we do so we could serve this more often for company. I've made this several times; it is interesting, unusual, and delicious. It's better with French green lentils de Puy. I used ordinary brown lentils once and it wasn't quite as good, though it was still very nice. It does taste different from the usual chickpea hummus -- it's more special. This was great! Only deviation to recipe was that I had no chorizo available so I used merguez sausage instead. Still was delicious. Excellent recipe. Just a heads up, this calls for the chops to be brined 2- 4 days...I did 1. But it's not a recipe to make in one night. Excellent rub on the chops and the apple leek purée is very good. 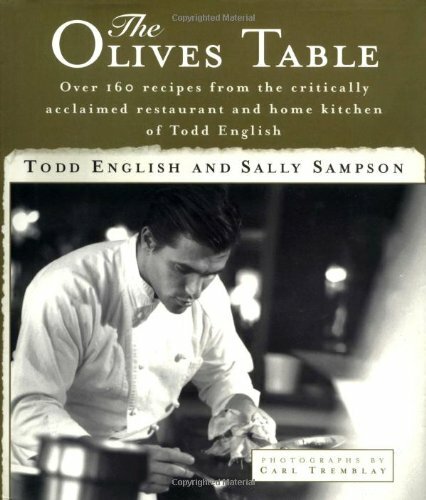 In 1989, Todd English and his wife Olivia opened the original Olives; since then the restaurant has moved to larger quarters, and Todd and his bold, inventive Mediterranean-inspired cooking have earned an international reputation. Voted one of the Top Ten Restaurants by Esquire magazine and the Best New Restaurant by Boston magazine, it has also been voted Favorite Restaurant in the Zagat Guide to Boston and Vicinity. In The Olives Table, the artistry of one of America's top chefs is on display, with more than 160 dazzling recipes from Olives and from Todd's home kitchen, illustrated with beautiful photographs by Carl Tremblay. Todd's robust, intensely flavored food begs to be savored and shared with others. And since the complexity of English's cooking comes from the layering of tastes and textures -- not exotic equipment or techniques -- by following the careful, step-by-step instructions, even the timid cook can recreate the dishes that the patrons of English's hugely popular Boston restaurant enjoy at the Olives table. Pull out the stops and begin a meal with Todd's signature Olives Tart, baked in a crisp crust and rich with olives and creamy goat cheese, pair Gingered Slow-Braised Lamb Shanks with Apple-Fennel Mashed Potatoes for your main course, and finish with Falling Chocolate Cake with Raspberry Sauce. Or for a lighter repast, try Pan-Fried Cornmeal-and-Cumin-Rubbed Cornish Game Hens served with Arugula Salad with Tomato and Cucumber Juice; finish with Mango-Raspberry Granita. Plan a simple but deeply satisfying supper of Roasted Clams with Chicken, Tomatoes, Artichokes, and Bacon served with roasted new potatoes and end with Gingersnap Risotto Pudding. Whatever meal you decide to create from these recipes, you won't be disappointed.